This post is from the US Department of Agriculture’s blog. It was originally published on August 7, 2018, and has been lightly edited with a short introduction on internship experiences for graduate students. Internships in graduate school can be a fantastic experience. They can expose you to a completely new way to do science outside of the university setting, or they can expand your skills in science-allied disciplines, such as journalism, science policy, or industry. In my case, I was fortunate enough to do an internship at a US Department of Agriculture (USDA) lab for a few months in the Fall of 2017. This research internship was funded by a National Science Foundation program and wound up being an eye-opening experience into the differences between a university lab and a federal research lab. Plus, I got to work in a completely new system from my previous research at Indiana University, a research system that is much closer to our bellies: wheat crops. You see, wheat plants in the United States and the rest of the world are in danger – danger from a nasty pathogen known as Fusarium. This pathogen can reduce the yields of wheat in farmers’ fields as well as produce this nasty mycotoxin (a fungus-derived toxin) that can be very harmful if it infects our food supplies. 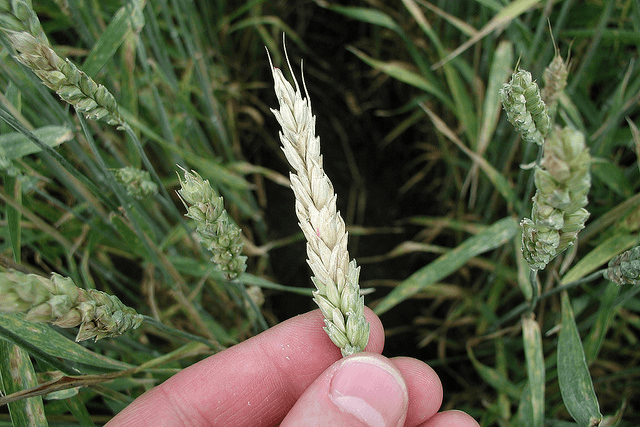 Typical premature whitening of a wheat head infected with the fungus that causes Fusarium head blight (Source: USDA Agricultural Research Service). Fusarium head blight is a devastating fungal disease affecting wheat and barley crops worldwide. According to the American Phytopathological Society, this disease has cost US wheat and barley farmers more than $3 billion since 1990. Agricultural Research Service (ARS) scientists, together with land managers and other scientists at research universities, are taking a variety of approaches to solving this problem. These include breeding resistant “cultivars” (cultivated varieties), using massive disease-forecasting models, and applying fungicides during critical junctures in crop growth to prevent Fusarium head blight. Recently, many scientists have also become interested in the idea of employing microbial species that already live on and inside crop plants to do the dirty work of controlling disease epidemics. These microbes, known collectively as the “plant microbiome,” have a lot of natural impact on the plant host. Some microbial species are beneficial, helping the plant’s immune system to fight off enemies, while others can be harmful. Although our research is in its early stages, we’ve already identified several potentially beneficial bacteria species. In future research, we hope to explore whether applying these bacteria to wheat seeds could help mature wheat plants resist Fusarium head blight. Additionally, we want to learn whether this preventive microbial treatment improves grain quality and prevents harmful compounds from accumulating. More broadly, our research supports the “farm to fork” continuum, exploring ways to safeguard the food we eat and the economic well-being of producers.